• Leg movement increases blood flow, decreasing the chance of blood clots. • Walking reduces the risk of heart attacks. • A 10-minute stroll every couple hours can lower blood pressure. • Exercise produces endorphines lifting your mood. • Walking reduces the risk of non-insulin dependent (type 2) diabetes. PHOENIX – During the best of conditions, travelers typically don’t stroll 2 miles through throngs of people with their carry-on bags in Phoenix Sky Harbor International Airport’s busiest terminal. However, some jet-setters are doing just that – for their health. 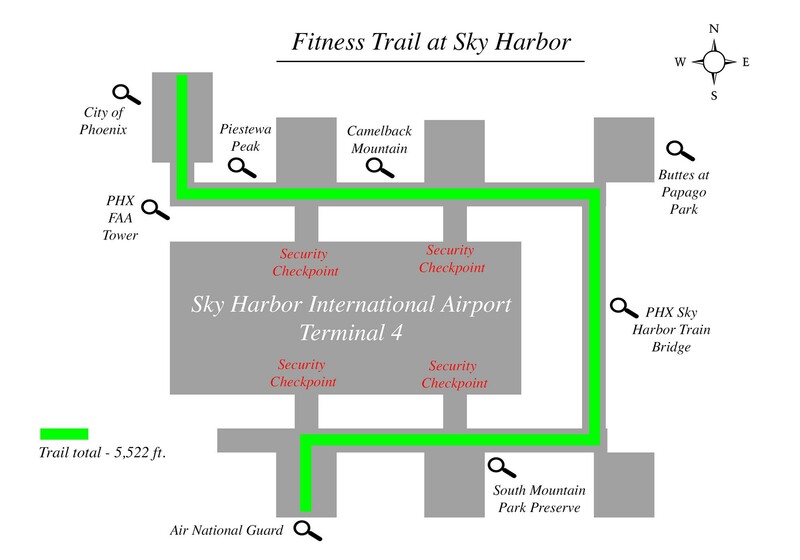 After downloading a PDF or logging onto Sky Harbor’s mobile site, travelers beyond Terminal 4′s security checkpoints can follow a fitness trail and get some exercise while viewing local landmarks. The U-shaped route is a little more than a mile long each way, running from gate A30 at the terminal’s northwest corner to D8 on the southwest side. 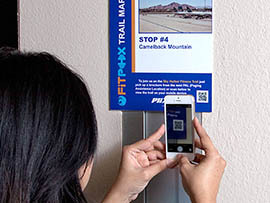 The Sky Harbor Fitness Trail, which opened in May, was developed as part of the city’s FitPHX initiative started last year by Mayor Greg Stanton, Councilman Daniel Valenzuela and Olympic swimmer Misty Hyman. Sky Harbor joins other airports in trying to keep travelers active while waiting for flights. Baltimore-Washington International Airport has two cardio trails that are designated American Heart Association Walking Paths. Each trail loop takes about 20 minutes to complete. Minneapolis-Saint Paul International Airport has a walking trail as well. San Francisco International even has two yoga rooms available for travelers. These and more participants can be found on the American Heart Association’s Start! Walking program website. Sky Harbor Fitness Trail features eight scenic spots marked by plaques, including Piestewa Peak, Camelback Mountain and the downtown Phoenix skyline. Heather Lissner, a spokeswoman for Sky Harbor, said people love the trail. With about 85 percent of all airport traffic going through Terminal 4, it’s been popular, she added. “Because it’s our biggest terminal and serves the most passengers, it’s a great opportunity to take a walk. Travelers between flights can get their exercise as well as seeing Phoenix landmarks,” Lissner said. According to the Centers for Disease Control and Prevention, traveling longer than four hours increases the risk of blood clots. One way to combat this, it says, is by increasing blood flow to the legs through frequent motion. Siddhartha Angadi, assistant professor of exercise and wellness at Arizona State University, said even 10 minutes of walking every few hours has its benefits. If you are on a longer flight, like a trans-Atlantic one, Angadi suggests travelers walk around the plane every so often. At the very least, he said, pumping your ankles while seated will help get blood flowing in your legs. Walking trail markers at Terminal 4 explain scenic views to travelers. 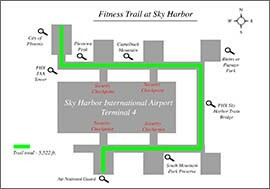 See the route and scene stops of the Fitness Trail inside Phoenix Sky Harbor International Airport's Terminal 4.